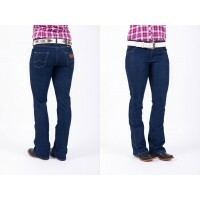 Ladies 14.5Oz Broken Twill Denim Slim Boot Cut - Blue Rinsewash .. Pink Filly Collection, Mid rise, Boot cut. 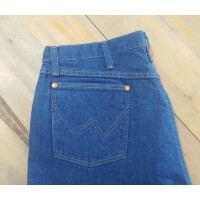 Features No-gap waistband and flat seam to make rididng e..
WILD CHILD Robust Cowbot-fit, Bootleg Cut Jean Premium stretch fabric. Mid rise, Boot cut. Discon.. 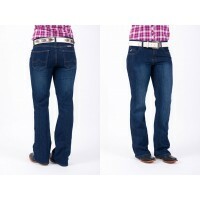 The Instantly Slimming jean from Aura from the Women at Wrangler® features a signature tummy contr..
One left! Size: 7/8 x 34..
One left! 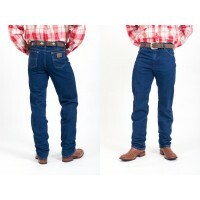 Size: 9/10 x 34..
Mens Western Fit, Straight Leg, Cowboy Cut. 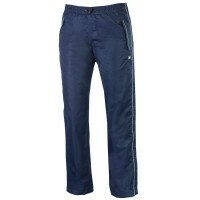 14.5Oz Broken Twill Denim prevents twisting for your com..
Mens 14.5Oz Broken Twill Denim Regular Fit - Blue Rinsewash ..
Mens 14.5Oz Broken Twill Denim Western Fit - Blue Rinsewash Inleg: 36 Waist: 26-44.. 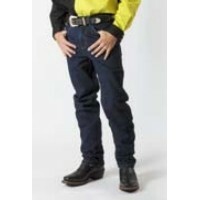 The Official pro rodeo Competition Jeans. 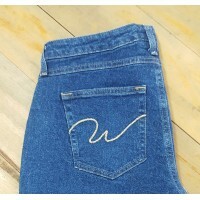 13 MWZ Original fit, 100% Cotton Heavyweight Denim ..